A picture is worth 1,000 words. 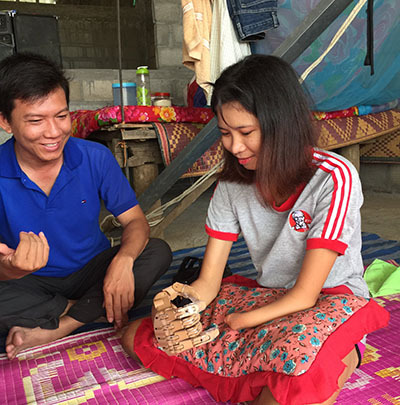 That may sound cliché, but for Srey Noun, a 17-year-old Cambodian girl born without hands or feet, the smile captured on camera when she was presented with custom made prosthetic hands revealed a life-changing moment. 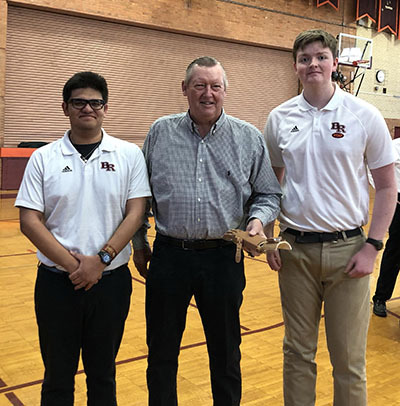 The hands, created using a 3D printer by Brother Rice High School engineering student Liam Coughlin, were delivered to Srey by Beverly/Morgan Park resident Paul Duggan at the end of March. Duggan traveled to the small town of Poi Pet. Cambodia to meet Srey and, with the help of LWB staff and volunteers, present the prosthetic hands. The Brother Rice/Love Without Boundaries project was a perfect fit! Within a few minutes, Srey was learning to use her new hands. The Maple Morgan Park Food Pantry, located in Morgan Park United Methodist Church at 11030 S. Longwood Dr., has shifted its services to the Client Choice model, per the Greater Chicago Food Depository updated standards. The Client Choice program allows needful families and individuals to shop the pantry just like a supermarket, giving clients numerous choices that will better serve their needs. It has taken the 36-year-old food pantry nearly a year to revamp and reorganize the existing space to adhere to the new layout guidelines, including providing additional floor space, storage, refrigeration and shelving units. Each client can choose a specified number of food and personal care items based on their family size. “Clients can now choose between varieties of hot and cold cereal, oats and grits, tomato sauces, and numerous other options,” Overstreet said. The biggest change for volunteers and organizers is ensuring that the shelves are well-stocked with a great variety of items. No longer will clients be simply given a bag of food, some of which they don’t need, want or even like. The Morgan Park Juniors have stepped up to this challenge in a new fundraising effort to support the food pantry. The group will host the movie “Big Night” on Weds., Apr. 10, 7:30 p.m. at the Beverly Arts Center, 2407 W, 111th St. This 1996 comedy/drama film follows two brothers who run an Italian restaurant in financial trouble, and their preparation for a feast to prove their worth to the community. Tickets are $10, and a cash bar is available. The Beverly Arts Center is donating the use of the Baffes Theatre, and all proceeds will help the Maple Morgan Park Food Pantry. Tickets can be purchased on the BAC website or at the door. For those seeking to support the food pantry on a regular basis, Overstreet is hoping for 300 households to commit to donating money each month. “Our needs have changed so much that monthly contributors are welcome so we can renovate our space and continue to accommodate the community,” she said. For those needing food assistance, simply stop by the food pantry on Tuesdays or Fridays between 1 and 3 p.m. or call 773-239-3013 for information. Lori Smith grew up on Chicago’s West Side, attending Notre Dame School for Girls and Jones Commercial High School. In 1973, she married Jim Smith, a South Sider and they started their family. The only real “battle” they had was Chicago Cubs or Chicago White Sox, until 16 years ago when Lori was diagnosed with Ductal Carcinoma In Situ (DCIS). DCIS, considered the earliest form of breast cancer, is noninvasive, meaning it hasn’t spread out of the milk duct. This diagnosis was just three weeks after her mom received the same diagnosis. Smith was treated with a lumpectomy and endocrine therapy at Little Company of Mary Hospital (LCMH). DCIS has an excellent prognosis with appropriate treatment, however, having a history of breast cancer increases the risk of a new cancer in the future, including an invasive carcinoma. In June 2018, Smith went in for her annual mammogram. The initial images were “all clear,” but next day, Dr. Jilma Patrick, fellowship-trained breast surgeon at LCMH, called Smith to schedule a biopsy because the full images of the biopsy showed atypical cells. In July, Dr. Patrick performed a lumpectomy that revealed an invasive papillary carcinoma. Smith had another surgery in August that showed no additional cancer cells. Smith didn’t need chemotherapy, but she would have to undergo 16 days of radiation and take an oral endocrine therapy pill for five years. She didn’t let this setback stop her from staying positive and exuding a wonderful energy. Every day after the 15–minute radiation treatment, her husband would take her back to their home in Palos Park. On day 16 when Smith came out of the radiation room, the team of doctors and technicians and her husband were there to celebrate the treatment’s completion. Continued self-care, including mammograms, is the next step for Smith. She also plans to do some traveling. Every five years for their anniversary Lori and Jim go on a trip. This past anniversary they celebrated 45 years, but they were unable to travel do to Lori’s health, so Germany and Paris await this loving couple. Smith is very appreciative for the LCMH staff, doctors, radiation technicians, her family and especially her rock, Jim. She knows she couldn’t have made it through her diagnosis and treatment without them. Smith will be among the thousands of people who will participate in the 20th Annual Beverly Breast Cancer Walk (BBCW), Mother’s Day, Sun., May 12, starting at 8 a.m., at Ridge Park, 96th and Longwood Drive. Over the past 19 years, the BBCW has raised more than $6 million to support LCMH’s award-winning Comprehensive Breast Health Center and impacted the lives of thousands of breast cancer survivors. This generous community support helps to sustain breast health programming, and last year to deepen its impact with the establishment of a BBCW Crisis Fund to assist LCMH breast cancer patients with emergent financial needs within our community. Register for the BBCW early to receive a t-shirt with your $30 entry fee; the entry fee for children ages 18 and under is $15; same-day registration is $10 more for adults and $5 more for children 18. Register and find details at www.BeverlyBreastCancerWalk.org. To schedule a mammogram, go to www.lcmh.org/onlinescheduling. 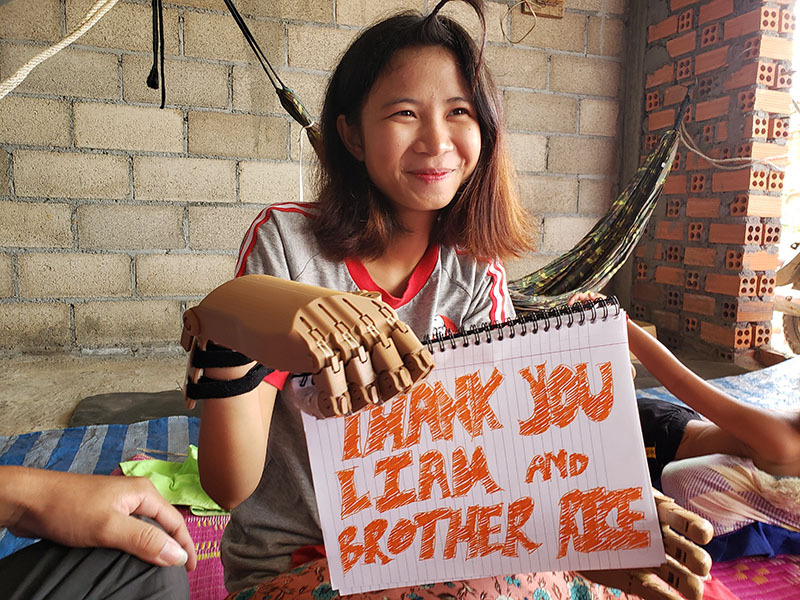 In late March, Beverly/Morgan Park resident Paul Duggan will be traveling to Cambodia with very precious cargo, a prosthetic hand custom-made by students at Brother Rice High School for a young girl attending a Love Without Boundaries school. How Duggan was able to connect seniors at his old high school with a student halfway around the world is a story of how love leads to possibilities. Duggan grew up in Beverly/Morgan Park, and graduated from Brother Rice, setting him on a path to his position as president of Jackson Boulevard Capital Management. Duggan is an active Rice alum who supports the school in many ways. A little over 18 years ago, Duggan and his wife Debbie adopted twin girls from China, the perfect completion of their family. The Duggans joined a group of adopting parents on a chat board, and were introduced to another adopting parent, Amy Eldridge. Eldridge was committed to improving conditions for orphans in China, and when the Duggans learned she wanted to start a foundation, they opened their hearts, and stepped up with support. Love Without Boundaries (LWB) was founded in 2003 with a mission to help improve conditions for orphans in China and today also brings humanitarian assistance to children in Cambodia, India and Uganda. Eldridge is the CEO and Duggan is Emeritus Chair. Last year, the not-for-profit organization provided more than 1300 medical procedures and 92,000 hot lunches, as well as education for more than 700 children. LWB also offers healing homes for the children undergoing medical procedures, foster care and other services that put the needs of children first. 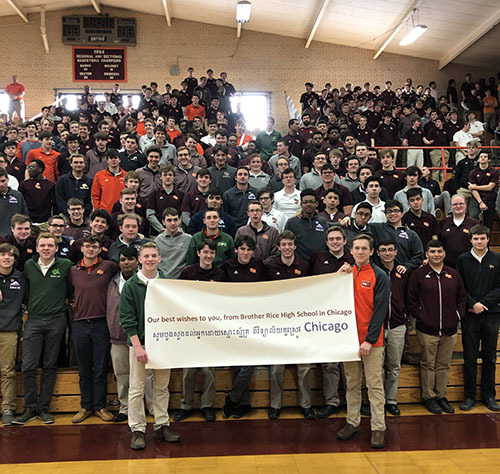 Brother Rice High School has always offered top notch education as well as a commitment to charitable acts. Duggan reached out to the school to support LWB. Through their homerooms, students donate a small amount each month toward the care of a child being served by LWB. When Duggan was introduced to the capabilities of the recently added engineering curriculum at Brother RIce, he instantly recognized a way to fill a very specific need: creating a prosthetic hand for a girl born without hands or feet who attends a LWB school in Cambodia. Brother Rice senior engineering student Liam Coughlin is leading the project, and assisting him is Matteo Valencia, a member of the Advocacy Club. Both students are part of Rice’s award-winning robotics team. The young men are using a manual developed by last year’s seniors, the first class to use 3D printers to create prosthetic hands. Last year, students made several “generic” hands which were donated to a not-for-profit organization in South Carolina. The hands have articulated joints, and are wired, so movements in the wrist enable the fingers and thumb to bend, making the prosthetics are functional. Creating hands custom-made for an individual and using measurements provided by the young girl’s medical team in Cambodia has been challenging and rewarding for Coughlin and Valencia. Coughlin has devoted many after-school hours to creating three prosthetic right hands so the recipient can use the one that fits best and offers the most dexterity. According to Daniel Mostyn, Science and Engineering teacher and moderator of the Robotics Team, Coughlin’s work has taken the program to a much more sophisticated level. Duggan will bring the prosthetic hand to the young girl in March, and he has high hopes that this very special delivery will not only change the life of a young girl but lead to even more life-changing opportunities for the children in LWB schools across the world and the dedicated students at Brother Rice High School to connect. Love Without Boundaries has the highest ratings from Charity Navigator and Guidestar. For more information about the not-for-profit organization’s work on behalf of children, visit www.lovewithoutboundaries.com. Photo caption: Mark Donahue (Brother Rice High School President) , Dan Mostyn ( Brother Rice High School Engineering teacher and Robotics club moderator), Liam Coughlin (Brother Rice senior Robotics Club member), Matteo Valencia (Brother Rice senior Advocacy Club member), Bob Alberts (Brother Rice Principal), and Paul Duggan. Anna Fratto is the latest addition to the BAPA team in the newly created role of Director of Economic Development. Beverly/Morgan Park current and potential small business owners have a dedicated resource to assist them with their opportunities and needs. Fratto began working for BAPA in November, just in time to assist in BAPA’s Holiday Cookie Crawl and the matching grant from the Richard H. Driehaus Charitable Lead Trust. She previously worked as the executive director for the Muscular Dystrophy Association and as the public affairs and community relations coordinator for CITGO Petroleum Corporation. Fratto’s work in both the non-profit and corporate industries gives her the knowledge to assist local small business owners with strengthening their businesses and to advocate for small business recruitment. Her depth of experience in developing and implementing marketing and fundraising campaigns and coordinating special events is a perfect complement to BAPA’s goals. Within her corporate experience, Fratto learned to manage volunteers, develop communication strategies, and foster relationships with schools and government organizations. To connect with Fratto, email her at afratto@bapa.org. City Year Chicago is making a big impact in the lives of nearly 15,000 Chicago Public School students on the south and west sides. City Year Chicago Executive Director Rebeca Nieves Huffman is a Beverly/Morgan Park resident who volunteered through the program from 1998 to 1999, and she now dedicates her career to helping other children reach their full potential and eventually make an impact in their communities. The program is part of an initiative that pairs AmeriCorps volunteers with elementary and high school students in 29 cities across the United States to address the risks and long-lasting effects of student drop-out rates. As executive director of the Chicago program, Huffman is responsible for raising the resources necessary to run the programs and to be the face and voice for the city’s youth. With a son at Sutherland Elementary School and a daughter at St. Barnabas School, Huffman is entrenched in the variety of educational opportunities available here. “Schools are a reflection of the value of the community. I have two kids with completely different educational needs, and it’s great that they can be met at these two separate learning environments,” she said. City Year Chicago is always looking for donations of money or time to help reach as many CPS students as possible. In April, the organization will hold its annual Ripples of Hope gala, which accounts for a quarter of their private revenue dollars. To find out more about City Year Chicago or make a donation, visit CityYear.org/Chicago. Meet Maureen Gainer Reilly, BAPA board president. Gainer Reilly has served on the board for three years, the past two as president. Her role at BAPA is to work to promote the Beverly/Morgan Park community to residents throughout the city, while also connecting neighbors and acting as an advisor to BAPA staff. Gainer Reilly spent the early part of her career in a variety of non-profit and social service organizations. In 2003, she started her own consulting firm, GO Consulting, which provides services in Project Management and Process Improvement. “My work enables me to assist BAPA and its small but mighty staff as they work to constantly improve the organization,” she said. Connect with BAPA in 2019; come to an event, read about neighbors in The Villager, volunteer, call the office for a quality trade referral, plant a tree with us, and help us make you Love Where You Live. Cecil McDonald, Jr. fell in love with photography in college. He was in his final year of undergraduate school studying Fashion Merchandising when he signed up for an introductory class as an elective to pass the time. He’s been hooked ever since. McDonald, a resident of Beverly/Morgan Park for more than two decades, now works as an adjunct professor at Columbia College Chicago, the same school from which he received an MFA in Photography. His work has been showcased both nationally and internationally in galleries in Chicago, Denver, New Orleans, New York and Haarlem, Netherlands. Last year, McDonald released “In the Company of Black,” a book of photographs featuring African-American subjects whom he describes as “extraordinarily ordinary”— educators, artists, administrators, business owners, teachers and students. “Cecil McDonald Jr.: In the Company of Black,” photographs from the book, will be on exhibit Jan. 19 to Apr. 14, Chicago Cultural Center 78 E. Washington St. Admission is free. The 144-page book began as a small project in 2007 when McDonald started to photograph his friends and family in attempt to showcase the difference between his fellow African-Americans and the African-American lifestyles portrayed to society. Soon, McDonald began taking photographs of strangers, too. But it wasn’t until several years later, while completing the Artist-In-Residency program at Light Work in Syracuse, NY, that McDonald was hit with the idea to create a book. “I saw other residents trying to turn their work into books,” he said. “So I thought ‘hey I should try that, too’”. McDonald presented the idea to his former teaching assistant Matt Austin of Candor Arts, an independent art book publisher based in Chicago. The book features an introduction written by Tempestt Hazel, a former student of McDonald, and was nominated for the 2017 Paris Photo-Aperture Foundation PhotoBook Award. Last month, a selected portion of the photographs featured in McDonald’s book were on display at Illinois State University Galleries. The same exhibition will be showcased at the Chicago Cultural Center in January. For McDonald, the photographs are the most important part of his recent journey. They tell a story that challenges the roles designated to African-Americans by our cultural landscape, he said. While McDonald is humbled by the success of his book release, he believes it’s the photographs themselves that have the potential to make the biggest impact. In fact, McDonald hopes the photographs never return to Chicago. Why? Because the whole world needs to observe them, to understand their symbolism. The Gandurskis bought their house in West Beverly a little over a year ago, and are finding it a great spot for their young children, Benny, 2, and Ellie, 3 months. Matt, a musician, music talent buyer, and bartender for Lagunitas Brewery’s Chicago Taproom, grew up at 104th and Leavitt and Julie, a teacher in Chicago Public Schools, grew up in Orland. Why did they choose Beverly/Morgan Park when it was time to buy a home? Thomas Chomicz got involved with the Beverly Area Planning Association (BAPA) through former BAPA board member Steve Murphy. The two served together on the Smith Senior Living board of directors, and Murphy believed Chomicz’s skills and knowledge of the neighborhood were a good fit for the Beverly/Morgan Park umbrella civic organization. “He said I could be helpful,” Chomicz recalled, and certainly that is an understatement of the value he has brought to BAPA and our community. With his professional experience and commitment to the work of the organization, Chomicz has helped BAPA make important improvements in programming, reporting and governance. Chomicz is a retired attorney and CPA. Over the course of his legal and accounting career he has served on the boards of many not-for-profit organizations. He has been on the Smith Senior Living board for 30 years, serving as director and officer as well as on committees. For the Saint Xavier University board he served as a director for nine years and as chair for four years. He was a director for the Retirement Research Foundation, and a director and officer for The Stenning, a charitable foundation. BAPA has benefited greatly from this diverse, high level board experience. In 2014, Chomicz rewrote BAPA’s bylaws. He also enhanced the financial reporting to the board of directors and consistently provided thoughtful and informed leadership to guide BAPA in its work. In his six years of service to BAPA, Chomicz has served on the organization’s development, safety and nominating committees, as well as the executive committee. He is currently vice president of the board. Chomicz will be retiring from the BAPA board in 2019. He encourages community residents to get involved in BAPA and use their skills to advance the organization as members, volunteers and on committees. “BAPA is a quality community organization that highlights the positives, achievements and outstanding reputation of the Beverly/Morgan Park community,” he said, adding that BAPA has a positive effect on local issues including housing, education, safety and community development. Chomicz and his late wife Eunice moved to Beverly/Morgan Park in 1972 and raised six children here. For more information on how to get involved with BAPA, contact BAPA Executive Director Susan Flood, 773-233-3100 or sfloood@bapa.org.